Moon square Uranus in the natal chart gives an almost compulsive need for stimulation. This can lead to a very exciting life full of change and peculiar events. Other people should find you to be an exciting person but also challenging due to some eccentric behaviors and strongly independent nature. You are subconsciously drawn to anything new and shiny and can be easily distracted due to your emotional compulsions. Even though you have your own very unique and sometimes odd way of doing things, you are open-minded enough to experiment and then quickly change your approach. Your home and family can manifest the peculiarity and excitement of Uranus. Moving from one place to another is common with this aspect. If not you, then your partner or children may stand out in some way. The Moon also represents the public, meaning that you stand out from the crowd in a notable way. This changeable or erratic nature can make others think you are rebellious, disruptive or reckless. You do form emotional bonds very quickly but may have trouble maintaining long-term emotional commitments. If so, this could be due to emotional detachment by a parent, usually the mother, or your tendency to become easily bored due to a lack of emotional stimulation. Whether male or female, your upbringing may have been unorthodox but allowed you the freedom to find your own way in the world. Your may nurture your children in ways others find strange. Your struggle is to balance emotional nurturing versus detachment and independence. Too much of one and not enough of the other will cause behavioral and relationships problems. Even though you may not consciously intend to, you can shock and upset others with your odd behaviors and tendencies. Authority figures in particular may not appreciate your lack of respect for tradition. But you are just as likely to entertain and add excitement to the lives of others. You have the ability to combine a humanistic and a scientific approach. Viewing things in a dispassionate manner can lead to inventive solutions to problems. Entertainment, psychology or the sciences would provide a stimulating career for you. Being a home maker would also allow you to express your unique talents, and provide a stimulating and exciting environment to bring up children. 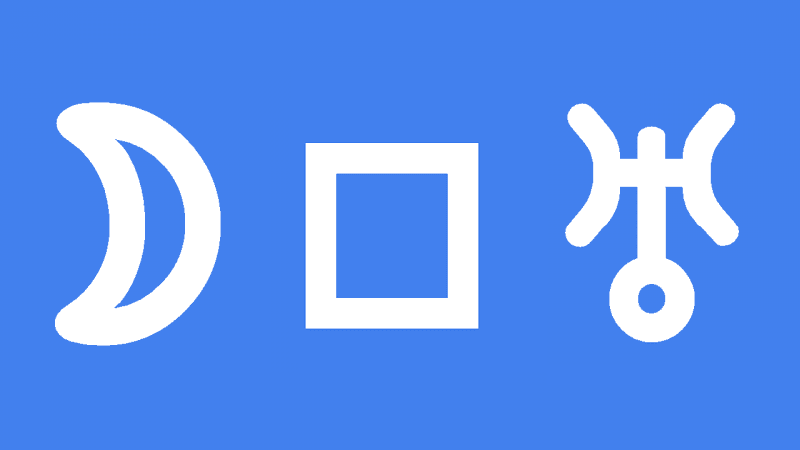 Transiting Moon square Uranus can cause rapid mood swings and impulsive reactions. You may feel jumpy and have little patience for anything requiring commitment or focus. You need extra stimulation and excitement and are likely to rebel against anyone who tries to tie you down or forced you to do something. This is not the time for boring routines or important duties because you will be easily distracted by anything new and shiny. This is also no time to relax because of an unsettling feeling or anticipation of something new just around the corner. If nothing exciting satisfies your need to stimulation and distraction, then you may go looking for it. Your instincts and reflexes may be strong and quick but not all that accurate. This is not a good time for making sudden changes especially in close relationships. New encounters may meet your need for a thrill but would cause a great deal of upset to your life and have a negative affect on loved ones. You may experience emotional outbursts from friends or family that would require extra patience and sensitivity. Your natural instinct will be to run from any emotionally demanding situations. A tendency to lash out yourself could escalate any drama. Although very upsetting, the air will be cleared and a settled state will return very quickly. This interpretation for Moon square Uranus transit applies to a lunar eclipse and full moon square Uranus. Harry Secombe 0°04′, David Beckham 0°07′, Jack Pierson 0°10′, John Addey 0°10′, Barbara Windsor 0°13′, Justin Bieber 0°15′, James Earl Jones 0°17′, Kathy Bates 0°20′, Riley Keough 0°21′, Dan Wilson 0°31′, Oscar Wilde 0°32′, Penelope Cruz 0°36′, Louis Braille 0°36′, C. D. Broad 0°37′, Ryan O’Neal 0°17′, Mark Knopfler 1°38′, O. J. Simpson 2°10′, Mel B 2°29′. I think that Moon Square Uranus people are 2 people. That’s from my experience of being friends with one. As Uranus is the planet of sudden and unexpected change – the square to the moon could represent sudden and quite different personality and mood changes. Also mental instability. The person I know with this aspect is 2 different people. One minute he talks lots, is jovial and inquisitive and the next minute very quiet – you’ll hardly hear a word from him. I think that moon squares are very challenging in general. Makes sense, very rapid mood changes come with the conjunction as well. My Moon in Aqua is exactly conjunct my mom’s Sun and the square from Uranus in Scorpio actually reflects her unconventional upbringing. She never met her mother and was raised by her other female relatives, and her father had concubines, resulting in her having aunts and uncles her age. One of them was openly LGBT at a time and place where it was unheard of. Does anyone else find that hard Moon-Uranus aspects lead to fear of intimacy, even with another Moon-Ura person? Anyway, paragraph 3 is dead-on in my case.